Please refer to our stock # VW1564 when inquiring. 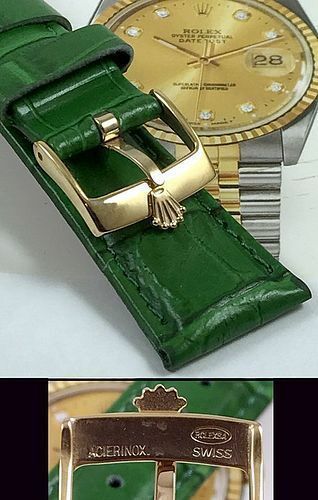 ROLEX 16mm 18k GP Logo Buckle 20mm Crocodile Pattern Genuine Leather. ROLEX 16mm Logo Buckle 18k Yellow Gold Plate marked: ICINOX ROLEXSA SWISS. 20mm GREEN Leather Strap with a Crocodile pattern SUISSE QUALITE. Designer variation strap for the Rolex Models 2-Tone DATEJUST, and Sport Models in 2-Tone or Gold. Also fits the President 1803. THIS IS A FINE COLLECTIBLE. DON'T INVEST IN THE STOCK MARKET. BUY SOMETHING PROVEN IN TIME. BUCKLE: Back marked: “ACIER INCX ROLEXSA Swiss”, 16mm Logo Buckle.